Some people will give different answers to what the best thing about homeschooling is, but for me it is easy to answer. The best thing about homeschooling is the FREEDOM! FREEDOM to do what we want when we want. To be able to have an eclectic homeschooling style. FREEDOM to use different curriculums that work with each individual child. Even better FREEDOM to use different curriculums for different subjects. How cool is that? Instead of having to use something that your child hates or just can't understand, we have the FREEDOM to change as many times as we want or to adjust what we have to work for our child. 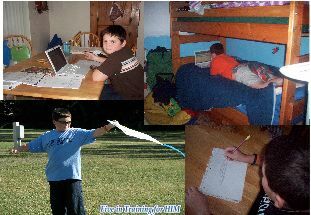 FREEDOM to do school at the table, on the bed, outside where ever works for your child on any given day. We have the FREEDOM to use Christian homeschool curriculum or secular homeschool curriculum. The best thine about homeschooling is the FREEDOM! What do you thing the best thing about homeschooling is?